Himalayan Little Poppy is a summer annual herb, 15 cm tall with leaves in a rosette, 2-3-pinnately cut. Flowers are purple, pinkish or white with purple streaks, often yellow inside, 0.8-1.5 cm across. Sepals are entire, 2.5 - 3 x 1.5 - 2 mm. Outer 2 petals are entire, not lobed, blunt, keeled at tip, 9-10 x 5-6 mm; inner 2 deeply 3-lobed, 5-6 x 4-4.5 mm; middle lobes spoon-shaped, hooded; outer lobes blunt. Stamens are 5-6 mm long; filaments about 3.5 mm long. Flowering stems are slender, 15-35 cm long, branched; flower-stalks slender, ascending; bracteoles thread-like. Upper leaves are stalkless or nearly so, basal ones 7-17 x 1-2 cm; sidestalks 4-8 pairs, stalkless, distant, deeply divided into elliptic pointed lobes; leaf-stalk base winged. Capsules are narrowly linear, fragmenting into 8-18 segments, 2.5-3.5 cm long, 2-3 mm thick. 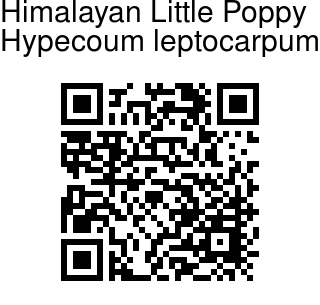 Himalayan Little Poppy is found in the Himalayas, hillsides and riverbanks, at altitudes of 2700-5000 m, from Kashmir to Sikkim, Nepal, Bhutan, China, Mongolia, Japan and Afghanistan to Russia. Flowering: June-October. 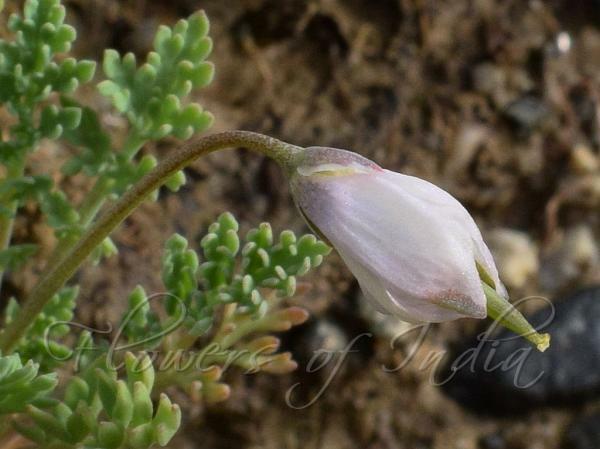 Medicinal uses: In Ladakh, an extract of the root of Himalayan Little Poppy is used for stomach pain. It is also used in Tibetan medicine. Identification credit: Lori Skulski Photographed in Phyang, Ladakh.